After her triumph at Charles Worthington, Mick was determined not to go wrong with her next session of blonding up. She was therefore slightly disconcerted when I handed her the name and address of her next assignment: Easton Regal in Clerkenwell. ‘I’d only ever passed through Clerkenwell and had never heard of Easton Regal so went into this one totally blind. My first thought on seeing the salon was that it was quirky – you’ll see what I mean if you go. Once inside, I liked that it was relaxed and unstuffy. My colourist came to find me and we had the briefest of chats – basically, she homed in on my root darkness and my concerns about it being a bit dark for summer, and dashed off to grab three shades of blonde. To be honest, my confidence in what would happen next wasn’t too high at that point as I hadn’t been given a lot of information which always sets my teeth on edge. I asked what she was doing and the response was this: ‘we’re doing half a head of blonde with three shades.’ Eek! I was delighted when post-wash (and head massage – YES TO THAT), I could already see the colour through the damp. It reminded me of the honeyed hue I used to go when I was in the sun. 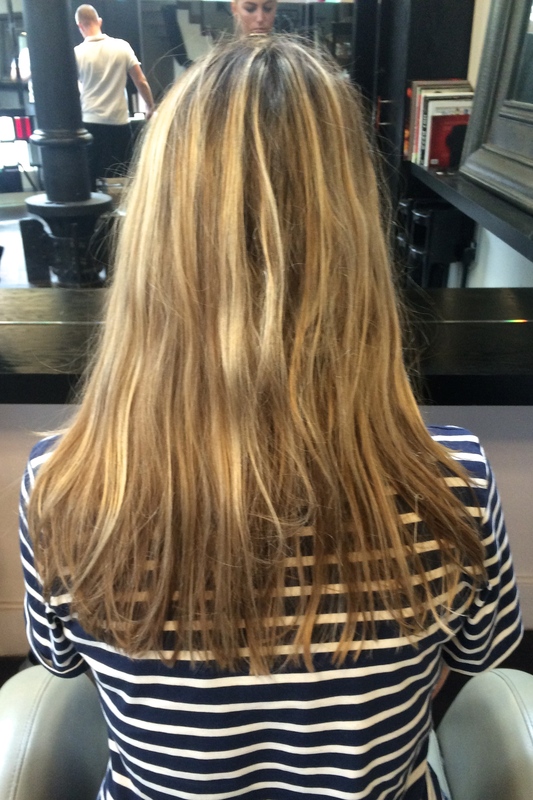 When dry, I was amazed: the colour was spot on – blonde and rich and seamlessly-highlighted.